A hermaphrodite in a shell, a mollusc with ears or a jet propelled bivalve. These are just some of the ways of describing the scallop (Pecten Maximus). The scallop shell contains both the female and the male gonad, a gill, a foot, mouth, digestive gland, eye spot, tentacle, mantle and hinge ligament. 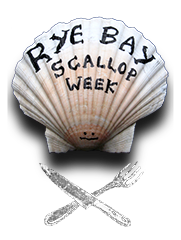 The scallop is not, strangely, considered an aphrodisiac in the same way as an oyster. But, having said that, Sandro Botticelli’s famous painting of Venus rising from a scallop shell is a perfect example of the symbol being used in fertility imagery. It is, like the oyster, an excellent source of protein, calcium, iron and vitamin B12 and is very tasty. Scallops prefer clean, deepish, full salinity water and do very well in the slightly warmer waters of the south and west coasts of England and Wales. They are fully mature at around three years old and it is possible to tell their age by the stripes or bands on their shells. One band for each year. Most spawning occurs from April to September and most growth occurs between April and June. Did you know that Rye’s fishing fleet moors almost two miles from the sea? There are more than 300 species of scallop in the world!